Former Fire Chief Don Rowley with his son and grandson look over the unveiled sign naming the Flushing Road fire station in his honor. FLINT TWP. – In celebration of 50 years of public service, Fire Station No.2, 3327 Flushing Road, was officially dedicated on November 14 as the Donald S. Rowley Fire Station, in honor of a retired fire chief. The township board voted in September to name Station No. 2 in Rowley’s honor and Station No. 1, 5331 Reuben Street, to honor former Fire Chief Jack Maxwell, who served as the township’s first full-time fire chief from 1947 to 1972, He died in 2008 at age 96. 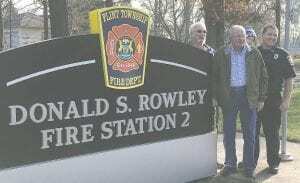 According to a proclamation read at the dedication ceremony, Rowley became an on-call fire fighter for the Flint Township Fire Department in 1958 and a full-time member of the department in 1961. He was appointed fire chief on January 4, 1982, and served diligently until his retirement on January 31, 1994. Chief Rowley opened Fire Station 2 on January 5, 1985, complete with sleeping quarters for three fire fighters, a kitchen, dispatch and alarm rooms, an office, and space for three fire vehicles. The proclamation also lauded Chief Rowley for protecting the safety and welfare of residents, visitors, and business owners of Flint Township with the utmost professionalism, care, and integrity for 36 years. He instilled a sense of duty to public service in his own family. His son, Mark, served the Flint Township Fire Department for 25 years, including five years as assistant fire chief; and his grandson, Mark, Jr., began serving as a full-time fire fighter for Flint Township on September 21 of this year. 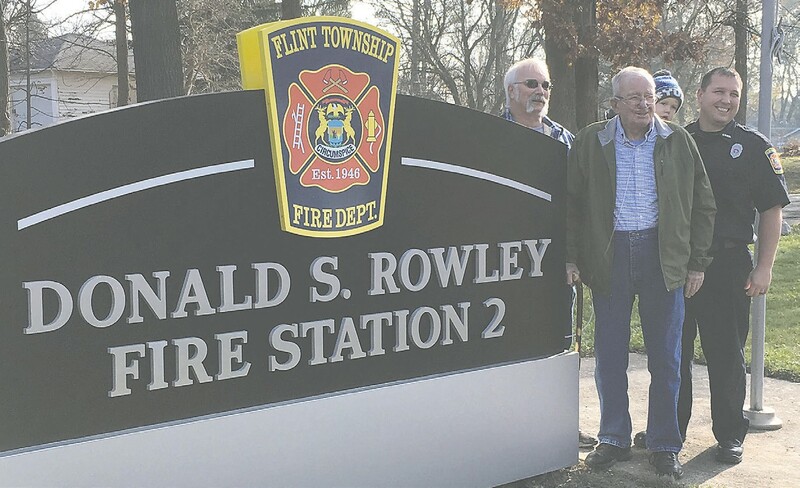 Chief Rowley is following his parents’ lead, in what is being acknowledged as a four-generation legacy of the Rowley family serving Flint Township.